‘Saturday Night Live Korea‘, apparently not content to go with just the sexual harassment controversy that’s now being investigated by police, ended up mocking an actress with breast cancer on a recent broadcast. Jung Yi Rang made light of Um Aing Ran‘s chest on the latest episode, which was an interesting choice since the latter had her right breast removed due to breast cancer in early 2016. 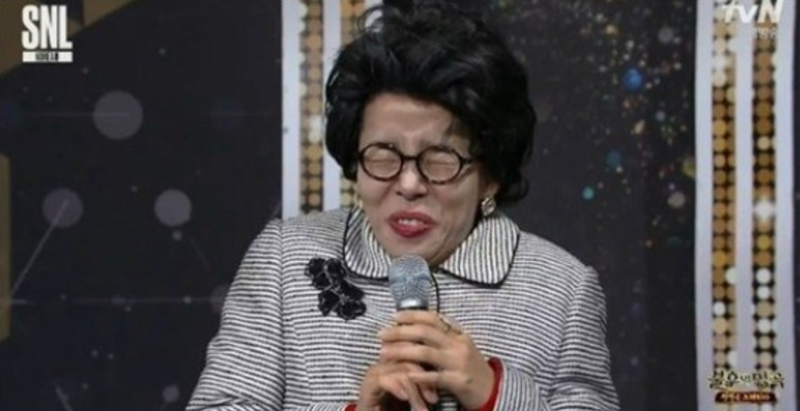 On December 3, the latest episode of “SNL Korea” showed a parody segment of comedienne Jung Yi Rang imitating veteran actress Um Aing Ran. During the segment, Jung Yi Rang dressed up as Um Aing Ran and competed in a singing competition against MAMAMOO’s Hwasa, singing Baek Ji Young’s “Like Being Hit by a Bullet.” The minute the word “Chest” came out in the song, Jung Yi Rang imitated Um Aing Ran while saying, “Whenever the topic of chests comes up, I feel ashamed. I don’t have a chest to hold.” Upon hearing this, comedienne Ahn Young Mi replies as a joke, “Not having a chest. I can personally relate to that.” However, after the segment, it was found that Um Aing Ran received a diagnosis for breast cancer at the beginning of this year, and underwent a major operation in removing her right breast. In response, many viewers began criticizing “SNL Korea” for seemingly degrading Um Aing Ran’s serious condition. Jung Yi Rang and ‘SNL Korea’ both apologized and said they were unaware of the situation with the actress’ health. If you believe that, then it’s probably not a big deal and can be chalked up to unfortunate ignorance. That said, I think the problem they’re likely to run into is that not many people are gonna take their word for it after they just finished trying to sweep the sexual harassment stuff under the rug.